Both advanced and developing countries stand to gain if women participate in the labor force at the same rate as men, work the same number of hours as men, and are employed at the same levels as men across sectors. Even without full parity, countries can grow the global gross domestic product (GDP) by $12 trillion by matching the rate of progress toward parity of their region's fastest-improving country. See the methodology for more on the factors that influence how much a country gains. 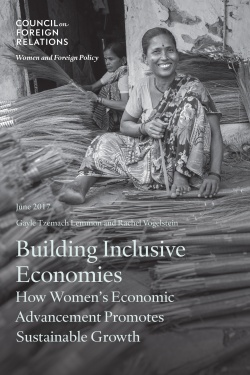 Despite the benefits of women's economic participation, significant legal, structural, and cultural obstacles persist. The McKinsey Global Institute identified four primary issues that, if addressed, will help achieve gender equality at work more quickly: education level, financial and digital inclusion, legal protection, and unpaid care work. What does this mean for your country? Select a country below to see the potential economic gains from gender equality&hairsp;—&hairsp;and the barriers standing in the way. Global GDP could increase 26 percent by closing the gaps between women and men in the workforce, which would benefit both advanced and developing countries. Even without full parity, countries can increase their economic growth by matching the rate of progress of their region's fastest-improving country. * "Matches best in region" refers to matching the rate of progress toward parity of the fastest-improving country in a country's region on each of three workforce measures: labor force participation, hours worked, and the sector mix of employment. See the methodology for more. To be equal participants in work, women need to be equal partners in society&hairsp;—&hairsp;in schools, health services, financial systems, legal institutions, and families. Cultural beliefs, from justifying domestic violence to considering it unacceptable for women to work outside the home, need to shift for women to improve their status. How far is from gender parity? Scores are measured on a scale of 0 to 100, where 100 represents full parity. The country that is closest to parity in the region is on the right. Compares women's and men's ability to find employment and be compensated fairly for it, share unpaid care work equitably, have the skills and opportunity to perform high-productivity jobs, and occupy leadership positions. Compares women's and men's access to health care, education, and financial and digital services, which are vital to economic participation. Compares women's and men's legal rights to self-determination, including the right to work, access institutions, inherit assets, and have the opportunity to participate in political life. Assesses women's safety from bodily harm, including from gender-based violence and child marriage. See the methodology for how these scores were calculated. Of the indicators used to measure gender parity, the McKinsey Global Institute identified four specific issues&hairsp;—&hairsp;education level, financial and digital inclusion, legal protection, and unpaid care work—that, if addressed, will do the most to achieve gender equality at work and generate significant progress toward realizing economic gains. Gender gaps in opportunity start early&hairsp;—&hairsp;in many societies, families prioritize boys' school enrollment when they cannot afford it for all their children. Indeed, sixteen million girls will never set foot in a classroom, and women account for two-thirds of all adults without basic literacy skills. Education at the secondary level and beyond is critical to prepare children for the workforce: educated women are more likely to have professional and technical jobs, assume leadership roles, and share unpaid word equitably with men. Also, the longer girls stay in school, the more child marriage rates drop and family planning and maternal health improve. The education score assesses the female-to-male ratio for the adult literacy rate, secondary education enrollment rate, and tertiary education enrollment rate. Access to financial services like bank accounts and digital payments can improve women's income-earning potential, making them more likely to invest in their health, education, and business, as well as better able to manage financial emergencies. Despite this, 190 million fewer women than men have a bank account. The financial inclusion score assesses the female-to-male ratio of account holders at a financial institution, rate of borrowing, and mobile banking rates. The McKinsey Global Institute grouped financial and digital inclusion together as one of the four primary issues because access to the two fields is closely linked: if one has access to digital technology, one can access financial resources. The internet and mobile phones open up opportunities for financial inclusion and increase access to employment opportunities. Flexible and remote work, for example, can bring women into the labor force. In fact, when women have access to digital technology, they are more likely to hold professional and technical jobs and spend less time in unpaid care work. Yet, in developing economies, only 74 percent of women own a mobile phone, compared to 84 percent of men. The digital inclusion score assesses the female-to-male ratio of internet and mobile users. Most countries have policies that make it harder for women to work: more than one hundred countries have at least one gender-based job restriction, while fifty-nine have no legal protection against workplace sexual harassment, and eighteen require a husband's permission for women to work outside the home. Explore the first-ever global index that ranks 189 countries on gender equality in the workplace. The score on legal protection for women spans laws to protect women against gender-based violence, ensure parity in property rights, and provide fair compensation. Women perform 75 percent of the world's unpaid work&hairsp;—&hairsp;effectively subsidizing the global economy. They do 60 percent more household work than men and perform the vast majority of unpaid care work for children, the elderly, and the sick. More time spent on unpaid work means less participation in the labor force: in countries where women average five or more hours per day on unpaid work, at most 50 percent are employed or seeking formal-sector employment. The unpaid care work score assesses the male-to-female ratio of time spent on unpaid care work. Explore policies employed by four countries to increase women's labor force participation. Despite the financial stakes, most countries still have laws that make it harder for women to work. Explore the first-ever global index ranking 189 countries on legal gender equality in the workplace. Economic leaders continue to make and measure policy in ways that undervalue women’s work and do not capitalize on women’s economic participation. ©2019 Council on Foreign Relations. All rights reserved. Displays the fastest-improving country in the selected countries' region on measures of labor-force participation, hours worked, and the sector mix of employment. See the methodology for more.